The province of Quebec is known for its sophisticated cities steeped in history and culture and a rugged, natural landscape populated with forests and deep, clear lakes. This 8-day vacation celebrates both aspects of this remarkable province. 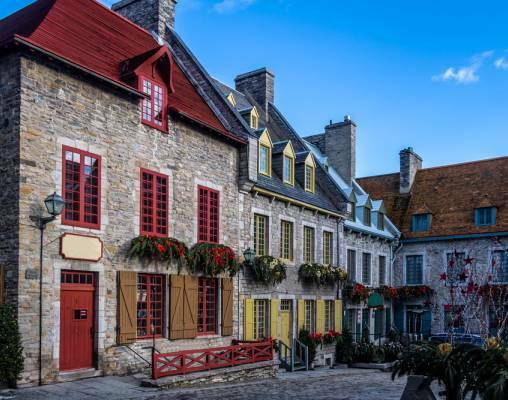 Beginning within the ancient walled city of Quebec City, explore this vibrant town, and then soak up the quiet on a countryside tour that takes you to the Montmorency Falls. A train ride aboard the Train de Charlevoix takes you to the spectacular Fairmont Le Manoir Richelieu, where your deluxe accommodations await. 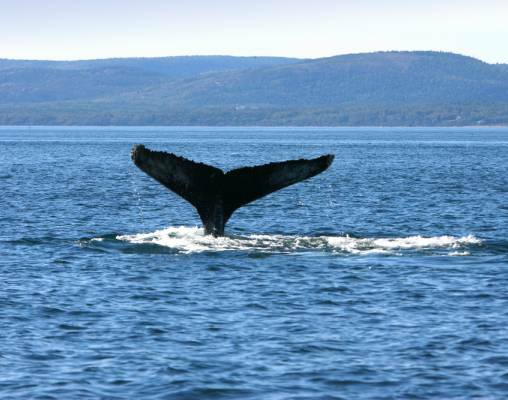 Then enjoy the fascinating experience of whale-watching on a half-day cruise along the St. Lawrence River. In your free time, explore the walkways of La Malbaie overlooking the mighty waters of the St. Lawrence River and enjoy the thrill and elegance of your hotel's on-site European-style casino. Your final full day brings you back to Quebec City. Arrive in Quebec City where you will be met at the airport and taken to your hotel by private transfer. The remainder of the day is at leisure to explore the cobblestone streets, unique restaurants and cafes or the old city, and quaint shops. Overnight Quebec City. 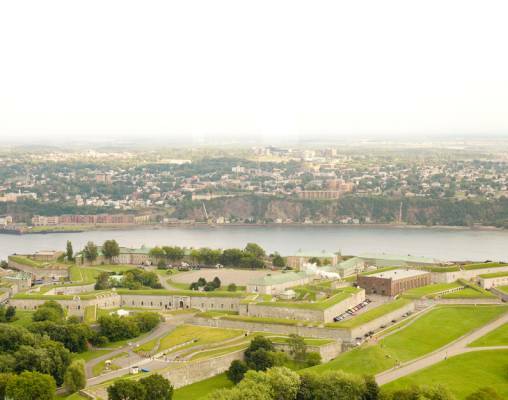 This morning your guide will meet you at your hotel and you will set out on a private sightseeing tour of Quebec City. Over the next three hours you will see both the historic and modern sites of this enchanting city during stops at the Latin Quarter, the Plains of Abraham, the Citadel, the Fortifications, and Place Royale among many other points of interest. Spend the remainder of the day exploring the city at your leisure. Overnight Quebec City. Use the morning to explore Quebec City on your own, then see Canada's oldest city form the deck of a cruise boat on the St. Lawrence River. As you cruise along the shoreline, a guide relates the story of "New France" and explains the origins of Quebec's most famous landmarks. Relax and take in the spectacular views of the Chateau Frontenac, Cap Diamant, Ile d'Orleans and Montmorency Falls. The rest of the day is at your leisure. Overnight Quebec City. 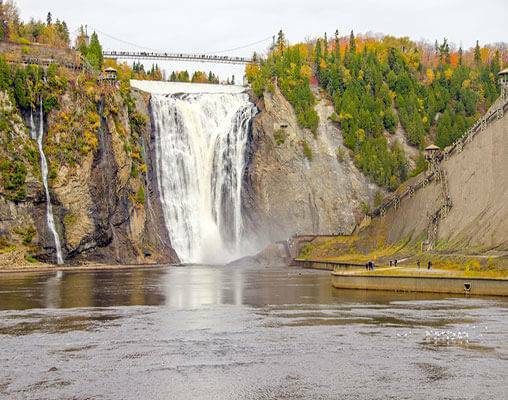 Escape to the beautiful countryside around Quebec City on this half-day adventure to Montmorency Falls and the Basilica of Sainte-Anne-de-Beaupre. Choose from a morning or afternoon tour, then explore the spectacular landscape just outside Quebec City. Along the way, visit popular Beaupre Coast tourist attractions like the Chocolaterie de I'lle d'Orleans, the Cuivres D'Art Albert Gilles (copper art museum) and the Chez Marie bread oven. Overnight Quebec City. 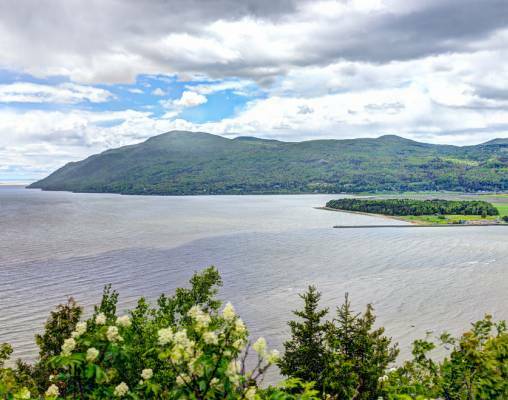 Take a private transfer from your hotel to the train station, where you will board the Train de Charlevoix for the scenic journey to La Malbaie. The train will stop at Baie-St-Paul, a quaint town known as much for its century-old homes as a haven for artists. The train continues its journey this afternoon, arriving in La Malbaie. Transfer to the elegant Fairmont Le Manoir Richelieu, located in the heart of Charlevoix. Overnight La Malbaie. Transfer from your hotel to the harbor (included), where you will board your AML Cruises boat for a half-day whale-watching excursion. Enjoy spectacular panoramic views as you cruise along the river, keeping an eye out for an array of marine life. This evening you may wish to visit the famous Casino de Charlevoix and try your hand at a game of chance. Overnight La Malbaie. Your vacation comes to an end this morning with a private transfer from your hotel to the airport. 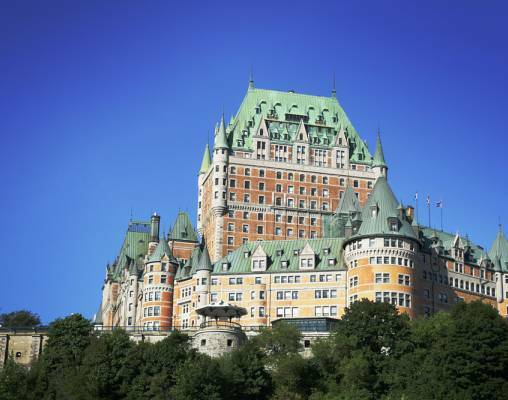 Hotel include Fairmont Le Chateau Frontenac in Quebec City and Fairmont Le Manoir Richelieu in La Malbaie. Click here to view testimonials for Quebec City & La Malbaie by Train. The trip was well planned by VBR and everything went smoothly. Quebec City was a beautiful place to visit. Everything about this trip was wonderful! The hotels were exquisite, we enjoyed the various tours arranged by you and the D2S limo service that drove us around was fantastic, drivers were delightful. We loved Quebec City, it is a charming place. Thanks for your help! Enter your details below if you would like to be notified when 2021 dates and prices are available for Quebec City & La Malbaie by Train. Hotel and Rail accommodations listed above, are subject to change based on availability at the time of booking. Prices are correct at the time of publication, however are subject to change at time of booking. Taxes are not included on rail portions and are subject to change. Rates are in US Dollars, per person, double occupancy.